UPDATE: LT staffer Loranne did some speed cataloging to put the app through its paces. Check out the video! 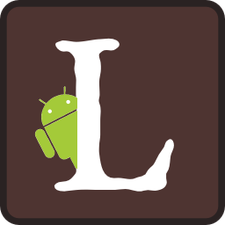 Meet the official LibraryThing Android App! Browse and search your library overall and by collection. Add books, CDs, and DVDs by scanning barcodes. The barcode scanning is SUPER FAST! Add items by searching by title, author, ISBN, etc. 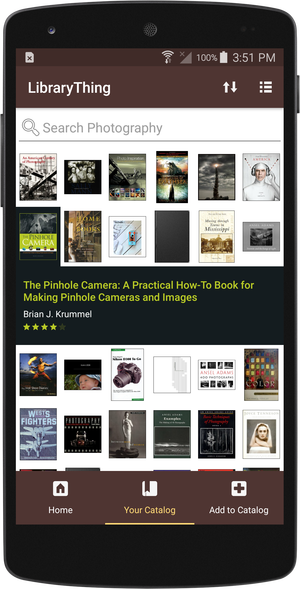 Browse and upload covers, using your Android’s camera. Do minor editing, such as adding books to collections and rating them. Major editing is done by a link to LibraryThing.com. Free accounts. We’re giving away lifetime memberships to anyone who uses the app. Register for a new account using the LibraryThing App, or sign into the app with an existing account, and you’ll be automatically upgraded. Come tell us what you think, and join the discussion on Talk. Need help? Check out our App Help Page. Our Android app has been a long time coming, and we’re pretty happy with it! Many thanks to our members who helped us fine tune things with the pre-release alpha version. Android devices running 4.0.3 (Ice Cream Sandwich – circa October 2011) or later. Does it work on wifi? Offline? Wifi, you bet. Offline, no. This is a much-requested feature, but not likely to come any time soon. Is there an [other-OS] version of the app? The iPhone/iOS app is available here. We do not plan to make apps for other systems. Can I use it on my tablet? It’s designed for a phone, but will work on your Android tablet, too. NB: some tablet cameras don’t have a built in flash, so you’ll want to make sure you’re scanning barcodes in a well-lit room. Will you add this feature? The app will never do everything, but future versions will do more. Your feedback is welcome on this Talk topic. Post any issues you run into on the bug report. I’ve written exactly one app in my life and it was a LibraryThing app with only had one function: scan a barcode and search my collection for a match. I was excited to see an official app was out and immediately installed it. And, to my surprise, there is a search function but I can’t use the barcode scanner with it, I have to type in ISBNs. Please tell me you’ll be adding this feature soon as all the bit seem to be there, just not interacting with each other. Please don’t make me eschew being official and go back to my little cobbled-together app. 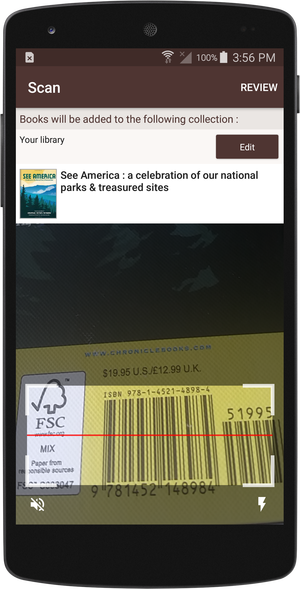 I’m pleased to say that our app does have a built-in barcode scan feature. When you tap “Add to Catalog,” look near the top-right corner of the add screen, to the right of the Search bar. There should be a little barcode icon. Tap this icon to scan barcodes with your device camera. If you’re having trouble or this feature isn’t working for you, please let us know! You can email LT staff at info@librarything.com. Yesbut. Does the barcode scan work _only_ when adding? Is it possible to search my library via barcode scan, without trying to add the book? Use case: I know I have this book on LT; I also have it in my hand. I can type in (part of) title or author, or ISBN, and find it in my catalog on the app. Can I scan the barcode and find it? jjmcgaffey is right. I know I can add via barcode scan, but I want to search my collection via the same method. I’m sorry, I misread your initial question. Currently, you can only scan barcodes to add to your library—not search. Other folks have requested this feature, too, and now that the Android app is out, we’re looking to expand features for future versions. This is just one of a few things we’re looking into as a possibility. Thanks for your feedback! Can you post the video that is on facebook of 2 people scanning a bookshelf on the web somewhere? I’m having trouble using the barcode scanner on the Android app. The first time I was able to scan one book before it quit. I uninstalled and reinstalled and was able to scan five books before it quit. Is anybody else having similar issues? Sorry to hear you’re having trouble. Please post about your issue, and include some more details (i.e. what type of device, and version of Android you’re using) on our dedicated Bug Report: https://www.librarything.com/topic/259639. This is wonderful and I love it! (there may be a typo on the “Creat Account” page) Thank you for making this app! Can you point me to where you see that typo, exactly? I’m having trouble locating it. Thanks! Can two people share a library? As in if my wife and I both have the app can we connect it to a single library so we stop double and triple buying books?! Absolutely. You can share your login credentials, and sign in to one account via the app on both your phones. Honestly – thought. Excellent work. That video was so impressive, too. It makes the most skeptical persons quick believers. Hi! I’m so excited about the app, but I’m having trouble with using the scanner to add DVDs. I’ve added books very easily (yay!) but when I scan the barcodes on my movie collection nothing comes up. I can, however, add DVDs by manually typing the ISBN printed above the barcode. Any tips? Is this the right place to ask? Thanks again! Sorry, just saw the link above to the bug report page. I’m so glad the app is out! I spent much of today recommending it to everyone. I was wondering if there is any way a future update could make adding a read date a minor edit instead of linking to the full site? One of the main things I like is to keep track of when I read books and it’s still a bit cumbersome to do on the app. Saw the talk topic page to use and posted there. I did download the app and immediately started adding books. But I have one problem with it: Apparently, it uses amazon as source and so I get many books which have just the title in the title fiels, a question mark in the ‘publication date’ and a ‘n/a’ in the publication field. Is there a way to change the source to library catalogs? Yep! From the home screen on the app, tap “Account.” This will take you into some basic settings and details about your account. About the middle of that screen, you’ll see a section labeled “Add to Catalog: Sources” with check boxes for Amazon and Libraries. Both are checked by default. Un-tick Amazon to stop using it as an Add Books source on the app. You can also reorder them by dragging and dropping so that Libraries is at the top, if you’d rather Add Books look in library data sources first, without completely eliminating Amazon. I hope this helps! Please email us at info@librarything.com if you have any further questions. I would need a bit more changes in the sources parameter: I have a lot of Hungarian book which are not cataloged in the main libraries, so the scan finds them only in the Central Hungarian Library. How to set that in the app? Thanks! More detailed data source selection is likely coming in later versions of the app. Unfortunately, your best bet for now is to go to Account within the app, and de-select Amazon under “Add to Catalog: Sources”—leaving only “Libraries” in place. I’m not certain whether the Central Hungarian Library is currently included within our OverCat library data, but a quick test should tell you whether it will get you what you need or not. If you have any further questions or feedback, please email us at info@librarything.com and we’ll be happy to help you from there. I scanned and added a book successfully. I then attempted to do three books in a single session. Click, click, click – nothing on LT. I then returned to the app home page and the three books appeared in LT. Would you please confirm that you can take several bar codes in a setting but must return to home or exit the app before they are added to LT. Said another way: What is the procedure for adding several books in a session? Is there a reason paperback books won’t scan in? All my books scan easily into my library, except the paperbacks. None of the paperbacks have worked. Some paperbacks have a different barcode inside the front cover. If you scan that, it should return a result where the barcode on the back of the book will not. I discovered that some years back when I first started using my CueCat to scan paperbacks into my library. There’s a wiki about scanning ISBNs and barcodes with the CueCat that ought to help for anyone using the new Android app. Excellent app Loranne, Thank you for making this app. Thanks so much for this. The reason I only had 113 items in the library was due to having to input by hand. Now, with the scanner application and my new BLU phone, I should have the 500+ items done in a jiffy. I am a happy camper (as long as I have a book with me)! Are there any plans for the Android app to be able to sort by LCC (or other criteria)? It would be nice to walk around my shelves with phone in hand and put the books in the correct order without printing out a 700 page pre-sorted list. I know I can go in a web browser and do the same, but the fonts are too small and the columns are not trimmed, so there is a huge gap between the title and the LCC. This forces me to scroll over to join the two. An app that gives the functionality to select which columns to add and then sort would be nice. I am so excited for this app. I put it on my phone as soon as I heard about it and have used it on every trip to the bookstore since. It is so convenient and easy to use. The one thing it doesn’t do that I wish it did is check my friends’ libraries, so I know whether I can safely buy something for them as a present. I would love the ability to view my friends’ libraries as well as others via the Android App. Any interest in adding this in the future? I would like to catalog an old church library. The vast majority of the books are antique… no longer in print and do not have ISBN numbers nor bar codes on them. I have tried to manually add a few but the app says such book is “not found.” Is this app suitable for cataloging such a collection? I feel perhaps that it isn’t a good match? If it can work, please let me know any hints. Thank you! Well, it’s better than no app. But tags don’t appear unless the app opens the web page. Also don’t’ see how to access my wiki & groups quickly & easily. This is important to me since I value the interactive aspect with other users. Will probably only use this to access my wish list. Is it possible to alter what is displayed on the app. I would like to be able to see the Dewey number to organiseI enter books. Unfortunately, no, not yet. We’ve had requests for adding other book info (like call numbers) to the app, but this will be some time coming. 1. Do you have an estimate on the data usage associated with each scan from my phone to my account? I have limited data via Verizon. 2. Any chance there will be an app to work with a Kindle Fire? I know it’s a long shot, but it has a camera and I’m just crossing my fingers because I’d have no data limits. Thanks for great service! I’m a lifetime member anyway, but very pleased to have this added functionality. Glad to hear you’re enjoying it! I’m afraid we don’t track data usage by operation—the app itself is pretty lightweight, and if you’re talking just scanning to add a book, I tested one now, and it took about 2kb. Now loading or searching your catalog (and especially adding or browsing covers) will be a different story—that involves processing much more data. It sounds like your phone doesn’t have wifi capabilities, right? I’m afraid a Kindle Fire app will be a while in coming. We’d like to do it, but apps are time-intensive to make to begin with, and there are significant changes we’d need to make in order to get a Kindle version accepted in the Amazon store. We’re a small staff, so it’s a matter of having the time to allocate to it at this point. I hope this information helps! Please feel free to email us at info@librarything.com if you have any further questions. I administer a library of 1,000 titles. I am the only person allowed to make updates. Currently, the app is only designed to let you browse your own library. You can share the URL for your Your Books page on LibraryThing—it’ll look like this: https://www.librarything.com/catalog/MEMBERNAME (with your username in place of “MEMBERNAME”). Alternatively, you might look into TinyCat, which is a great way to allow others to browse your library (and is mobile-ready; no app to download). Feel free to email us at info@librarything.com if you have any further questions! I am so excited for this app. I put it on my phone as soon as I heard about it and have used it on every trip to the bookstore since. It is so convenient and easy to use. Please consider making an android app that will work nicely on tablets, specifically one that will work in landscape mode. We have a tablet in the room with all the books and were hoping to use the app to find stuff. The website has so much info, the app not so much. Thanks for your feedback! I’ll make sure it reaches our app developer. If you have any questions, or there’s anything else I can help you with, please feel free to email me at info@librarything.com, and I’ll be happy to help you from there.